Victoria specially made for the story. Originally posted February and March 2004. Along with the rest of the site, this story was taken down in 2007 but not restored until 23 November 2011. I can't quite remember but I think I advertised for new writers for the AFT back in 2003. I do remember putting guidelines on the site and certainly Jack approached me with his story idea, which I really liked so we did it.. 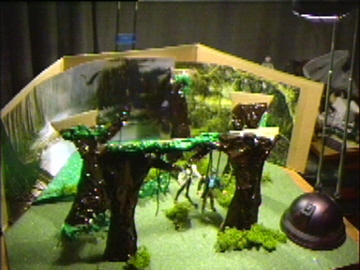 The set uses a green sandpaper floor from a modelshop and a printed jungle backdrop. The trees are made of foil painted brown with string painted green to make the vines. It's dressed with green moss, also from a craft shop. The tent is made simply out of folded paper. The console inside the tent is actually from the Millennium Falcon from Star Wars and made by the brilliant Niub Niub's diorama site. At the time I wasn't keeping a close eye on the size of the stories and the original posting of Plants and Animals ran over eight pages per episode rather than the standard four. I've corrected that for this run. 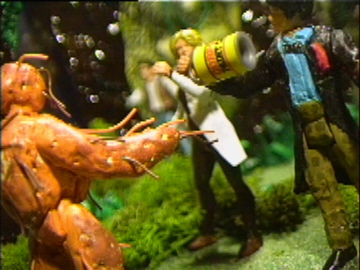 Several bits of photoshop trickery are in use here, including a wave filter for the underground sections and a nice green glow for the Krynoid to cover that it's actually an orange Axon figure! The is the first time we see the Doctor encounter the Krynoids but he clearly knows of them. Presumably a holdover in Jack's original 8th Doctor script but it's not contradicted by The Seeds of Doom where the 4th Doctor seems to have some prior knowledge of the alien plant. The story was originally called Vegetation Growth. 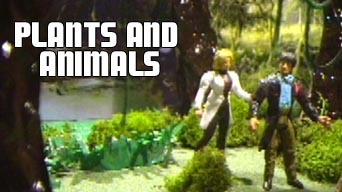 When I was writing short Dr Who stories it featured the eighth doctor and his half Cyberman companion Flast. When I had to change it to make it suitable for the Dr Who AFT I used the second Doctor to make it like one of the missing adventure stories, a familiar foe against a new Doctor. Jane originally joined the eighth doctor and Flast and would later be revealed to be an escaped android that tries to kill the Doctor and Flast, and ends up destroying the Tardis, gives you an example of how farfetched my writing is! I used the Krynoids because I love the idea of the whole pod infecting human’s thing; it reminds me of the eggs out of Alien trilogy. The idea of the Doctor having special underwater breathing equipment was taken from Star Wars episode 1 where Obi Wan and Qui Gon Jin dive into the Gungan Lake. Since the Krynoids have only starred in one story there is still much unexplored territory. In this story the pod in the lake does not germinate it only contaminates the water causing a slower effect.